A pretty cool movie, filled with beautiful details, exciting action, and enough to make it feel like the LOTR films, even if it isn’t quite as good. This is a great movie, very close to the other films that came before it in all kinds of ways. The scenery and sets are just as beautiful and astonishing as ever, and so is Peter Jackson’s camera movement. Here is a director who is clearly a master of fantasy and of making movies in this world (Middle Earth), and this movie delivers exactly what we were hoping for. The story itself is just okay, basically putting Bilbo on a journey that is in many ways like that of Frodo in the first trilogy. 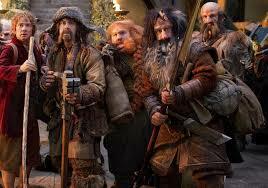 Bilbo also travels with a band of unusual characters, and gets into all sorts of adventures. There are times when the movie seems like it’s trying too hard to connect to the original trilogy, but then there are plenty of times when we welcome and appreciate those connections, letting us feel the familiarity of a world we have come to know and love. The action and effects are terrific here, and this is a very fun film. The Hobbit: An Unexpected Journey is the first movie of the new trilogy of films from the lord of the rings universe by peter jackson. I am so happy that they got him back as the director. there is nobody else in the world who should have made these movies, and that includes guillermo del toro, who for a while, was the director attached to the project. del toro is a master of creature movies, from pan’s labyrinth to hellboy, but this movie needed jackson and it got exactly what it needed. every frame of the movie shows that. In the hands of Peter Jackson, this movie feels right at home with the other films. it has tons of connections to the lord of the rings movies, including an opening that actually combines it with the first film by showing us the day of bilbo’s party from some new perspectives. we get to see, for example, how that sign ends up on his front door that says no admittance, except on party business. there are whole moments that feel right out of the lotr films, such as when the elf soldiers arrive on horseback in rivendel and circle around the dwarves, the same way our heroes were circled around by men on horseback at the start of the two towers. the music in this film is the same music from the lord of the rings movies, and that’s another nice connecting bridge. so are the returning cast members. ian mckellan as gandalf, ian holm as bilbo, and elijah wood as frodo. they all make their appearances early on, but there are more familiar faces to come. we get a council meeting that brings together hugo weaving, cate blanchett, and christopher lee, all reprising their roles. the returning actors help merge the two trilogies together as one, but even more importantly, the shots and camera movement feel exactly the same as they did in that original trilogy, that we all fell in love with. this first hobbit movie is long, just like all three LOTR movies, coming in at 3 hours, but that’s not really a bad thing. it feels like a nice, complete movie, loaded with action and excitement. i love that these movies all have their own climaxes and all feel like their own movies, while still being a part of something bigger. there’s no question about it, the journey will continue and has a long way to go. But so much happens in just this single film, that one really couldn’t ask for anything more. peter jackson definitely gives you your fill with each movie. 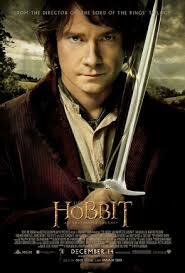 like the first lotr movie, the fellowship of the ring, it takes a while for our hero, bilbo to get going. there’s a lot of setup as he starts out at his home and has to be invited on an adventure by gandalf, (just like frodo was in that first movie.) and just like that film, it takes a good deal of convincing to get him going. there is even a shot of gandalf getting angry, while in the hobbit home, and the room turning black around him, just like in the fellowship movie. there are actually a lot of shots or moments that feel repeated here. the one that stands out most is when this movie’s warrior king, thorin (a dwarf king), is down on his back, wounded from battle, with the pale orc standing over him, about to slice down with his sword. that’s when thorin, in desperation, grabs his own sword and slices up to cut off the pale orc’s arm. everything about it, from the swooping camera shot down on thorin to the slow motion of the arm being sliced off, is right out of the fellowship movie, when the knight slicing the ring off sauron’s finger in the opening battle scene. at first i had a problem with how similar these shots and others were. it felt like this movie kept trying to do the same thing as the first trilogy, only not as well. when gandalf shouts out to the dwarves, “down here, you fools,” for example, it seems like the only reason he’s calling them fools is because it connects his dialogue with what we heard in fellowship (“fly you fools.”) but then as the movie goes on, and there was even more of this repetition, it actually became more acceptable. that’s because jackson isn’t trying to be lazy here. he’s not trying to copy the other films, but trying to let the audience enjoy the familiarity. when we get dwarves running through giant fiery caves, across wooden bridges, it’s as cool as the heroes running through the cliffs and mines in the fellowship. that’s what he’s going for. i love the way peter jackson does all of this. he really uses what worked in his original trilogy, particularly the fellowship movie, to make this movie feel like part of the same world. and it does. the action is very exciting and abundant here, with us never getting tired or bored. whenever there is a lull in the action with our heroes on the road, jackson gives us a flashback to a great battle from the past, or a scene of a mysterious discovery, just to keep our need for excitement satisfied. now, there are things that i didn’t love about the movie. no villain died by the end, for example. that was one thing i liked about the first film, that the leader of the uruk-hai met his end. and if it’s the goblin king who serves as the villain who dies, then there should have been a better fight leading up to it. i also don’t know if i really like this guy playing thorin, who sounds exactly like sean bean’s character, borimir, did in the first movie. clearly thorin is supposed to be a combination of aragorn and borimir, with aragorn’s past, (a man who should be a rightful, future king, and the leader of the group), but borimir’s personality (he turns on bilbo a lot in this movie.) And the story to the whole film really isn’t anything great. it’s fine, and gets the job done, but it doesn’t stand out as anything special. the story does keep our attention though, and leads us from one entertaining moment to the next. that’s certainly enough to make this an enjoyable film. the movie really does look amazing. every shot has that sweeping, beautiful look that only peter jackson can deliver, these are time capsule movies, meaning they are some of the greatest fantasy epics of all time, and i’m pleased to say the hobbit looks just as amazing as the films that came before it. the camera movement is also used beautifully here, constantly moving around, keeping our engagement. there is a lot of setup here, and a number of villains, and all of that works too. i think we will be finding out more about this necromancer in the later films, and maybe even seeing more of Saliman the white (Christopher Lee) and what would lead him to turn evil. I like Jackson’s strategy here of trying to make this movie feel like the fellowship. Maybe that will be his technique for the entire trilogy and the second hobbit movie will have many similarities to the two towers. If that is so, then it seems like an interesting idea, and one that so far, is working out just fine.